We are always very heartened both by the response we receive to the articles we post on Pravmir every day and by how many of our articles are shared and reposted both on Facebook and on other sites. This inspires us to continue our efforts to post articles drawn both from the common heritage of all Orthodox Christians and, in particular, from authors writing in Russia today. Several people help produce this site, most of whom contribute their efforts on a voluntary basis. But there are also some types of work – such as translating and editing – that demand so much time and effort that we want to reward our contributors with modest honoraria. 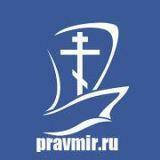 The Russian-language version of Pravmir shares its resources with us, but this alone does not always cover our costs. We very much hope that the readers of our English-language site will also help support us, so that we can continue to post original translations that cannot be found anywhere else, either online or in print. A donation of $20 will cover the costs involved with producing the translation of a modest-sized article. If you wish to assist us in continuing to produce high-quality Orthodox reading on a daily basis, please visit our site and press the “Donate” button. Please do not forget to mention your Baptismal name, so that we can thank you by offering our prayers for you! We thank all of our readers and supporters for being with us!